KARACHI: As the overall election day in the metropolis remained peaceful and the whole process remained free, fair and transparent, the dwellers have turned down the election boycott call of Mutthida Qaumi Movement-London (MQM-L) Altaf Hussain and took to streets to cast their votes. The entire elections process remained peaceful throughout the day in the city as no violent incident, report of polls rigging were reported from any part of the metropolis except one in Lyari area where a man who was showing himself as a policeman was caught casting bogus votes. He was held by the voters there and handed over to the security personnel for further action. Earlier on July 23, Altaf Hussain in his video message had called for a boycott of the elections however the peaceful citizens of the peaceful city rejected his call and voted for change. According to a detailed survey of various polling stations conducted by Pakistan Today, it was revealed that the polling process at the majority of polling stations was too slow and it took more than 30 minutes for a citizen to go through all the voting process. The voters turn out at the polling stations of the city remained very low till noon as major political parties specially Muttehida Majlis-e-Amal (MMA), Pakistan People’s Party (PPP), Pakistan Tehreek-e-Insaf (PTI), Pak Sarzameen Party (PSP), Muttahida Qaumi Movement-Pakistan (MQM-P) did not field polling agents, established election camps that compelled voters to return without casting their vote. “We are here as we are offered Rs 2,000 per day to work for the PTI. We have been given pick and drop facility, two-time food by the local leadership to do the job of polling agent”, a female polling agent at Shah Abdul Lateef Bhittai Grammer School, Shanti Nagar told Pakistan Today. Interestingly, a day before the elections, almost all the political parties spread messages on various WhatsApp groups asking for the availability of youth for performing duties of polling agents in different constituencies with Rs3,000, a political analyst said, adding that this was the reason they slowed down the voting process in the city. As many as 105.96 million registered voters of the country on Wednesday were given a right to franchise in the 2018 general elections which included 55.9 per cent male voters while 44.1 per cent female voters. Out of the total number, 26.99 million voters were registered in Sindh of which 2.44 million were male and 9.95 million were female voters. 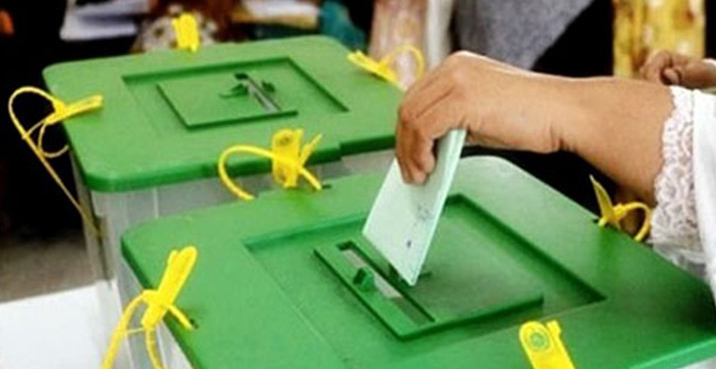 The total number who had to elect their representatives contesting elections on 61 National Assembly and 160 Provincial Assembly seats in the 11th general polls of the country. Amid strict security measures, with personnel of both the police and military deployed, polling began at 8 am and, without any break, concluded at 6 pm across 17,758 polling stations of the province, out of which 2,716 had been declared highly sensitive whereas 10,864 were declared as sensitive. According to the consolidated security plan made by the law enforcement agencies for elections day in Sindh, four Pakistan army personnel and two Sindh Rangers personnel were deployed at every polling station in the city. In the provincial capital Karachi, as many as 21 officers of the colonel rank, 42 majors and thousands other personnel were deployed who remained available on their security duties along with the police and Rangers and in order to keep the environment of the metropolis safe for the voters. While the Army personnel remained inside the polling stations, Rangers troops were stationed outside the polling stations. The police remained securing areas around the polling stations. Around 10,657 police personnel remained on patrol during the elections across the province, of whom 2,933 cops will be patrolled in the provincial capital. The Bomb Disposal Squad stayed alert during the polls to avoid any untoward incident. Ambulances of various welfare organisations were directed to the station within a kilometre of each polling station to provide relief in case emergency situation. Seven people were injured after clashes between two rival political groups at a women’s polling station in Khipro area of Sindh’s Sanghar district. Polling was halted at a polling station following the clashes. The dispute started between voters of the Pakistan People’s Party (PPP) and Grand Democratic Alliance (GDA) at a polling station in Yamin Hingorjo after a woman was stopped from casting the vote on technical reasons.